The continents are the most complex and diverse parts of Earth. The interiors of continents contain the oldest rocks, and record the early formation and evolution of our planet. Continents are crisscrossed by faults, new and old, that developed to relieve the stress and strain of constant, though geologically slow, plate tectonic motion. Some of these faults can be mapped at the surface, but many have been either covered over by sediments deposited after they formed or are very deep and never reached Earth's surface. To determine how features seen at Earth's surface correlate with structural and compositional differences deep within the planet, seismologists need denser networks of seismic stations so that they are recording seismic waves that propagate through finer and finer slices of the earth beneath them. This information will also enable scientists to link structures inherited from earlier stages of continental formation to known and potential geologic hazards (e.g., earthquakes, volcanoes, landslides). How does a seismic station work? How do I read a USArray Station Monitor seismogram? 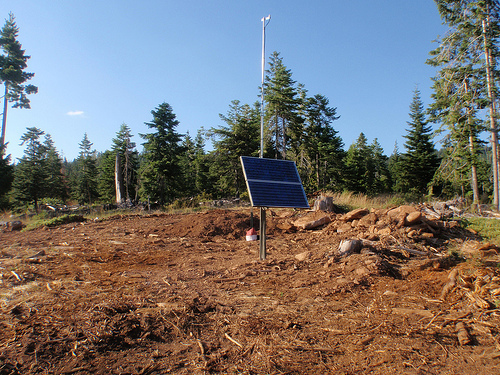 How is a seismic station installed? How do seismic waves make an image of Earth's interior?